Strategies that are a pure waste of time. Slot machines too have some strategies that would help you increase the probability of coming up with a winning combination. However it is advisable to bust the myths first and then move on to the strategies. Count the spins: Slot machines are not blessed with a memory to count their spins. It is only programmed to account your balance. Hence, do not waste time in counting the spins. The spins are purely random and are not in any way correlated to the previous spins. The time of a day affects the slot payout: Slot machines are programmed differently from one another and the timing of the day can in no possible way affect the payout. Irrespective of the time you may hit a jackpot just about any time during the day. Now that you are aware of all that you are not to do, let's have a look at what you can do to improve your winning odds. Set your goal before starting. If a jackpot is what you are looking for then opt for slot machines that have progressive jackpots that would go higher than $100,000. If small wins are your goal then avoid looking for progressive jackpot. Opt for slot machines that give bonus on every repeat play. If a jackpot is what you aim then don't play smaller denominations, play the maximum permissible coins. The denomination should be on the basis of your budget. 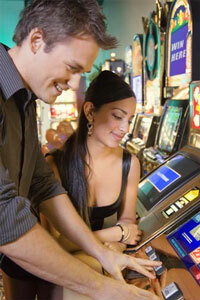 There are slot machines that give generous rewards for playing maximum permissible coins. If it is out of your budget go for machines that accept coins of lower denomination but play maximum permissible coins. Opt for nickel slots than dollar slots. Understand the odds of the game. The results of every spin are determined by the computer program and can be altered by the casino owners. A machine set at 90% means that for every hundred dollars bet on an average ninety dollars would be paid. The balance ten dollars go to the casino as profit. Depending on your luck you can make thousands.